It can carry nuclear weapons. It has a three-stage solid propellant. This is an improvement from Agni 4 which was a two-stage missile. It can reach targets in the range of 5,000 to 8,000 This makes it the first missile in the Agni series to be an Inter-Continental Ballistic Missile. (ICBM) Agni 4 could reach upto 4,000 kilometres and was called ‘Immediate-Range Ballistic Missile’ (IRBM). India has placed an order of M-777 artillery guns from the United States. The last artillery guns that we bought were the Bofors guns from Sweden about three decades ago. India’s first 2G (second generation) Ethanol Bio-refinery is being set up in Punjab. It will produce Ethanol which can be used to blend petrol and diesel. Ethanol is derived from various sources such as sugarcane, bamboo, etc. It is a cleaner fuel and ensures that the petrol or diesel burns completely. This will help reduce toxic elements from being exhausted in the air. Saumitra Chaudhari Committee Report on Auto-Fuel Policy of 2025 recommended that we should focus on Ethanol blending to tackle pollution and sustainable living. 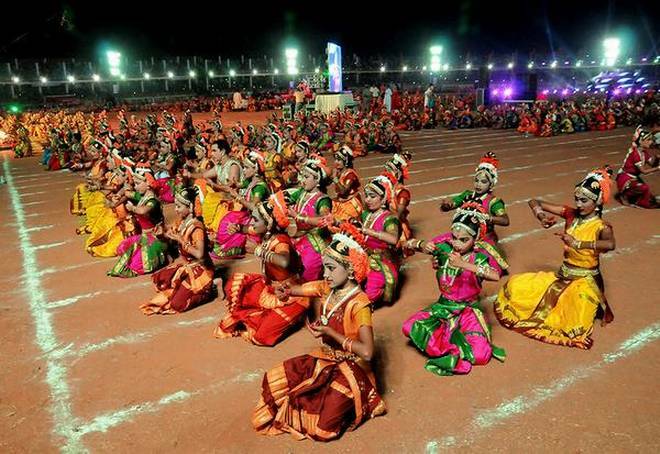 A new Guinness World Record was set by about 6,000 Kuchipudi dancers as the largest performance of Kuchipudi (in number of dancers) in Vijawayada of Andhra Pradesh. Kuchipudi is a performance art with both dance as well as drama. It was detailed by Bharat Muni in Natya Shastra. Natya Shastra is one of the oldest and the largest books on performing arts, and is also referred to as the ‘fifth veda’. Kuchpudi is one of the eight classical dances of India. Ministry of Consumer Affairs and Google India are collaborating to conduct a ‘Digitally Safe Consumer Campaign’. The aim is to educate people about digital platforms and improve their digital literacy. Good Governance Day was observed by the Central Government on the 25th of December. This day was chosen to mark the birthday of the former Prime Minister, Atal Bihari Vajpayee. People for the Ethical Treatment of Animals (PETA) has announced that the PETA Person of the Year for 2016 is Sunny Leone. Last year, Kapil Sharma (the comedian) was given this honour. Sunny Leone was chosen for her ‘work to promote rescue of homeless dogs and cats’. Forbes India released the 2016 List of Indian Celebrities. Salman Khan topped the list with about earnings of the Rs. 270/- crores in this year. Shahrukh Khan came second. China launched TanSat satellite to monitor global carbon emissions. It is the third country to do so after Japan and US. Which of the statements is incorrect? Who is said to be the author (or compiler) of Natra Shastra? Good Governance Day is celebrated to mark whose birthday? Which of the following committees has drafted the Auto Fuel Policy 2025?